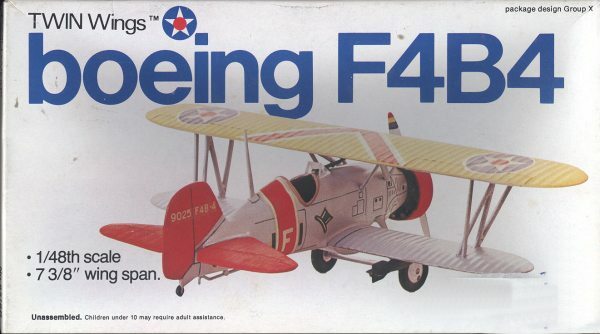 Boeing became a player in the fighter market in the 20s/30s with the F4B/P-12 series of planes. They were just what was needed at the time. Rugged, easy (actually fun) to fly, inexpensive and able to meet the requirements of the day. The Navy loved them and kept them in the fleet until the mid-1930s, but wasn't really thrilled with the navalized P-26 offered as a replacement. Even as late as the early war, the F4B was still being used as a training aircraft. What this really is, is the old Aurora kit. You can even see on the inside where the Aurora copyright mark was blobbed out. It has the same thick, single piece wings and stabilizers, the same empty cockpit and the same base with chocks molded right into it. It also has the same huge ejector pin marks all over the place and on just about every piece. What is missing out of my kit, is the pilot and the guy on the ground getting ready to spin over the prop! Your only options are the bombs and if you don't use them you'll need to fill some large holes. The instructions are quite basic showing three construction steps. 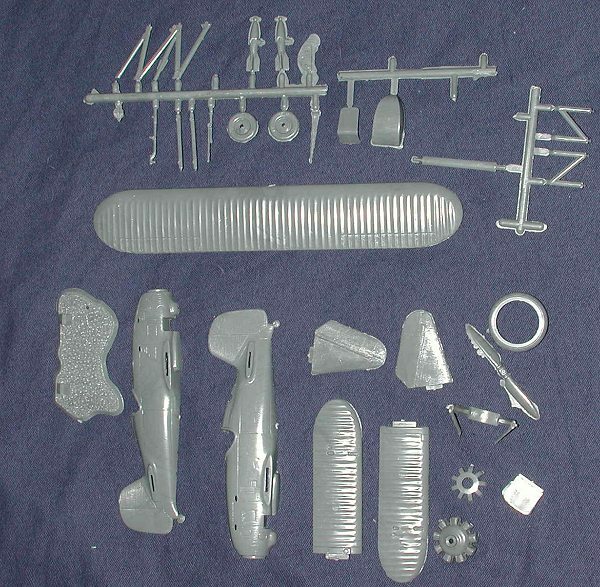 Actually, that is a lot for a kit with so few parts! 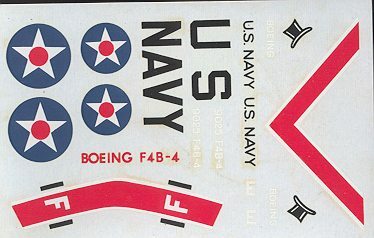 The decal sheet has markings for one plane from VF-1, the TopHatters. Though the insignia looks suspect, the rest of the sheet really doesn't look that bad and is probably quite usable. The painting guide just lists the parts and what colors they should be. As you may have guessed, this really isn't a kit for the serious modeler. And since Classic Airframes came out with its F4B-4 last year, isn't even that hot a ticket anymore. However, I do know folks who really like these old kits and want to build them just the way they were. Sort of a trip down memory lane. These old Aurora kits are out there if you choose to seek them out. Some have been modified, like the three WWI kits that Monogram puts out every once in a while. Some are just reboxed with new decals like this one and the Glencoe Nieuport 28. All are easy to build and just plain fun. If you would like your product reviewed fairly and fairly quickly by a site that averages thousands of visits a day, please contact me or see other details in the Note to Contributors.